If I had to choose one dessert as the most nostalgic for me, that would be this family recipe for English Trifle. Every holiday we would travel to my aunt’s house for a huge feast and a dazzling dessert table covered with homemade chocolate cake, lemon and mincemeat tarts, usually a pie of some sort, and of course, English Trifle. 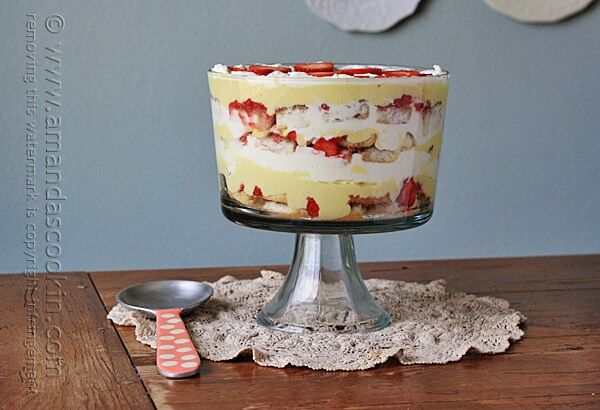 A trifle is a layered dessert that contains custard, sherry-soaked cake, fruit, jam and whipped cream. 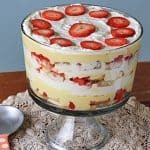 I have quite a few trifle recipes on this blog, but this English trifle recipe is one that my family has always loved. Recipes can vary from family to family, but the basic elements remain the same. 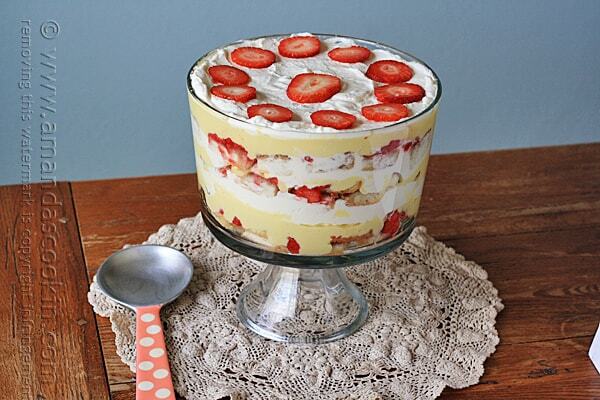 A sponge cake soaked in spirits layered together with custard, whipped cream, and fruit. I believe one of my aunts used to add banana slices to hers as well! I was actually born in England but came to the states when I was just 2 years old. So growing up I was surrounded by words like “blimey” and “rubbish” and other such British terms. 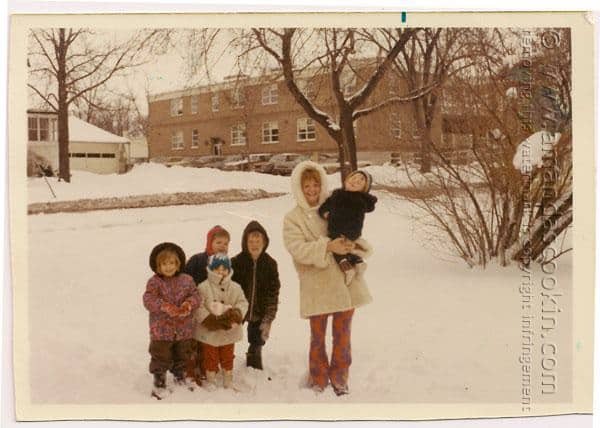 This photo was taken shortly after we arrived in the states back in 1969. Two of the children in the photo above were our new friends, the girl in the pink coat and the boy with the red hat. Over the years, trifles [in America] have been adapted to fit into a family’s tastes. Some use pudding, some don’t include sherry or Madeira wine, but instead non-alcoholic juices, and some even use chocolate and other ingredients. Another reason that the trifle has been adapted is simply out of necessity. English custard can be purchased in a box (Called Bird’s Custard Powder ) in the same fashion as American pudding. But it can be difficult to find in many American grocery stores, so people have switched to using what is readily available to them. I’m actually half Scottish (my dad was born in the Shetland Isles of Scotland) and half English (mom was born in England, I in Leicester). I still have family in the UK, some in Cornwall, more in Droitwich Spa and others in Canterbury just to name a few! 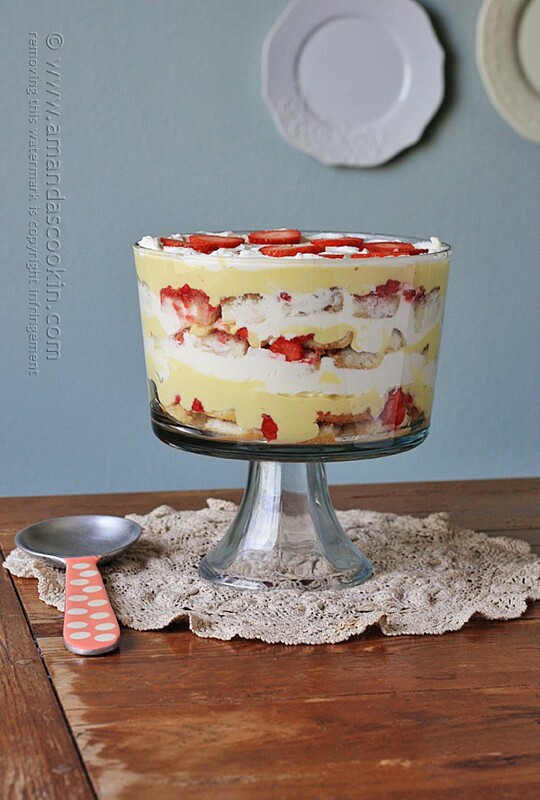 Growing up, my family always used Bird’s Custard Powder in our English trifle. However, it’s hard to find where I live, so I went ahead and made the custard from scratch. I really do love pudding, but for this dessert, I insist on using custard. There’s something about the beautiful aroma of custard that reminds me of the house we lived in before coming to America. I savor it. Bird’s custard can be found in some specialty grocery stores, or you can order it online. 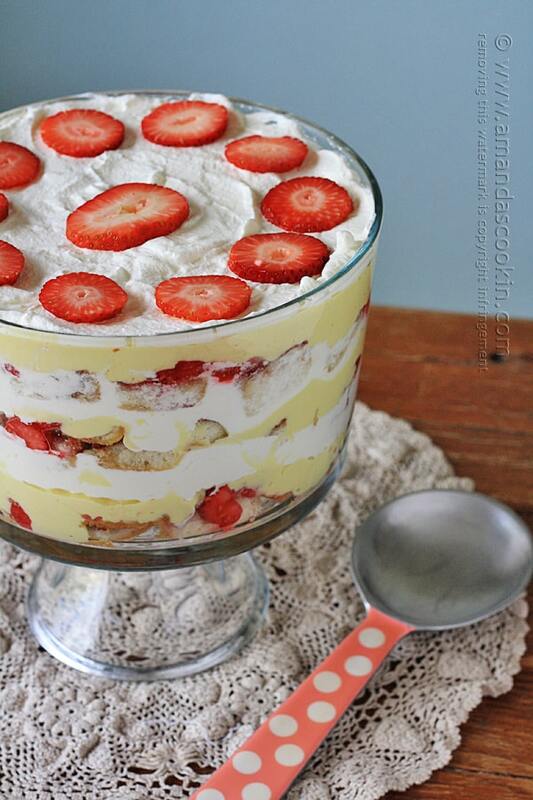 You can use a purchased cake for this trifle. Most English cooks use a Madeira cake, which is similar to a pound cake in America and was named after the wine that often accompanied it. 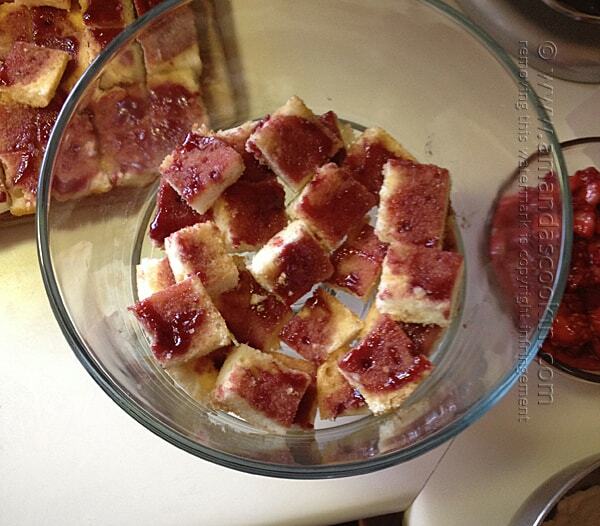 You can also use ladyfingers, or as they are called in England, trifle fingers. 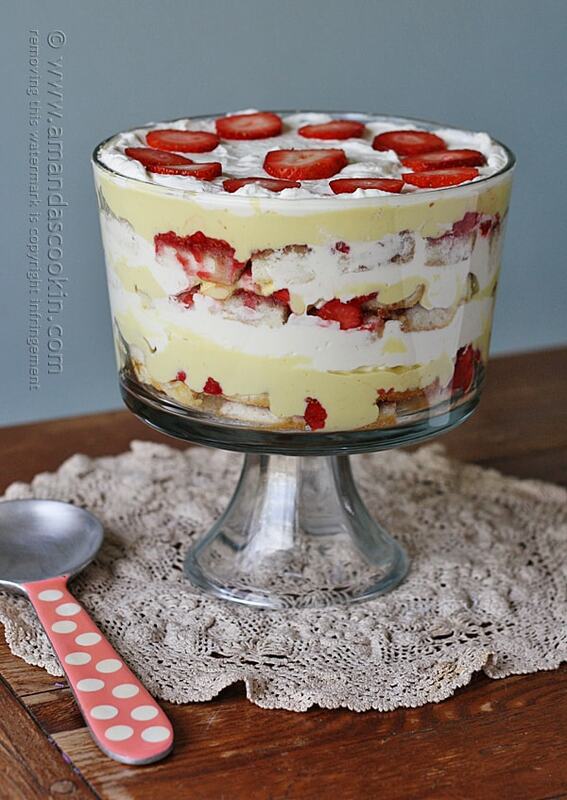 A trifle is made in a similar manner to a tiramisu. I had actually made a white cake and we only used a few pieces, so I used the rest to make my trifle. You will want to make the cake and the custard first. 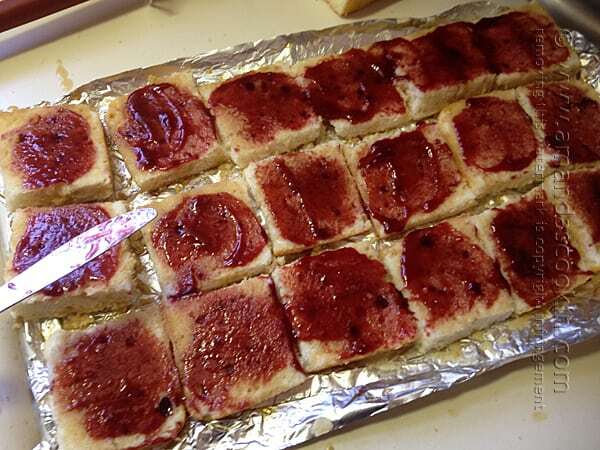 Obviously, if you are using a packaged pound cake or ladyfingers, then start with the custard. If you are making a box cake or cake from scratch, be sure to bake that up first. Both the cake and the custard will need to cool before assembling the trifle. If you are using Bird’s custard, follow the preparation instructions on the canister. 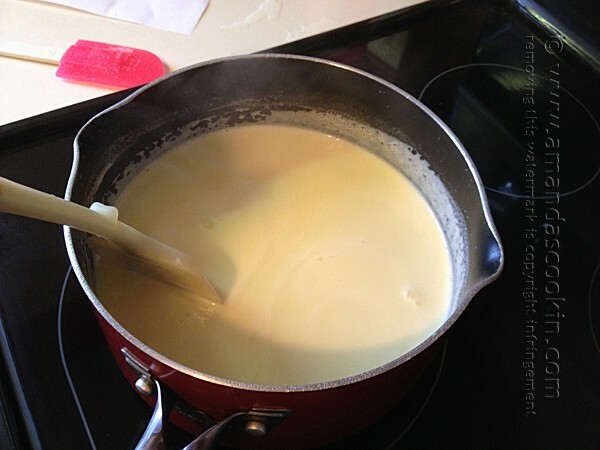 For a custard from scratch, begin by heating the milk, cream, and vanilla in a saucepan. You just want it to come to a simmer, you’ll see steam rising from the surface as well. 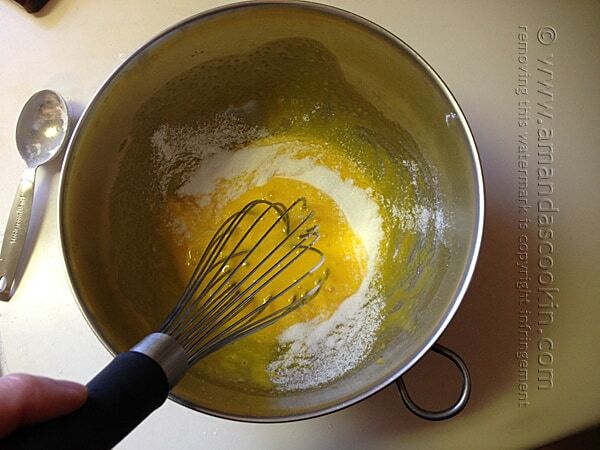 Whisk the egg yolks together with the sugar and cornstarch. It will be all lovely and yellow. Next, you’ll temper the eggs (follow the instructions in the printable version) and pour everything back into the saucepan to thicken. 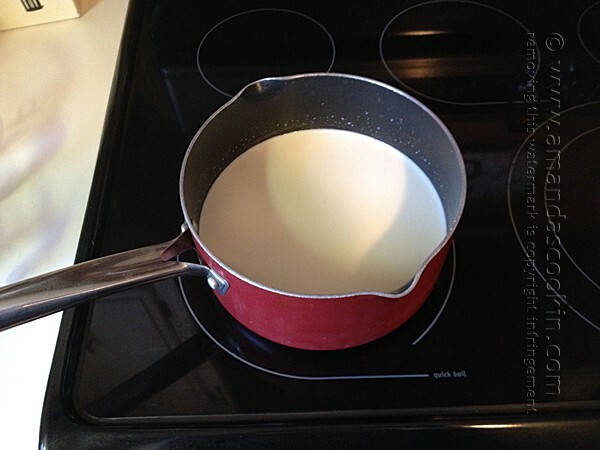 You need to do it slowly so you don’t burn it, but custard can be finicky, so you need to make sure it heats enough to bubble for several minutes. If it doesn’t bubble long enough, the structure can break down and the custard will turn from thick to runny. The good thing is that if you’ve chilled the custard and it’s lost its thickness, you can put it back on the stove and reheat it to thicken it back up. I quicken the cooling process by using an ice bath. 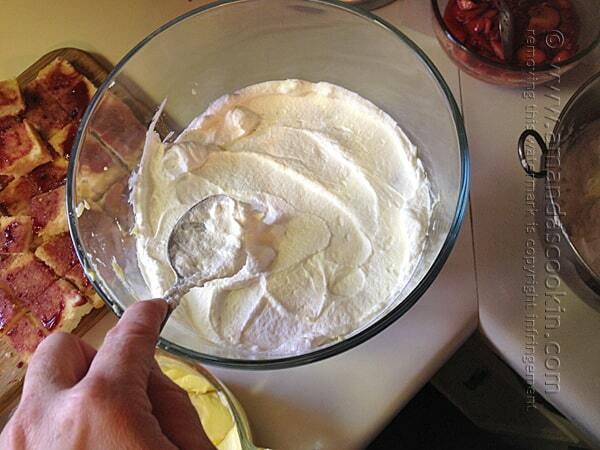 Fill a large bowl with ice and put the hot custard into a bowl that will fit into the larger bowl. After that’s in there, add some water to the ice to make the ‘bath”. This will chill the outside of the bowl that’s holding the custard, which will help its contents to cool faster. Because you are brushing the cake with sherry, you want the cake pieces to be small enough to soak it up. I sliced my cake in half horizontally. Place all those pieces cut-side up and brush them with the cream sherry. 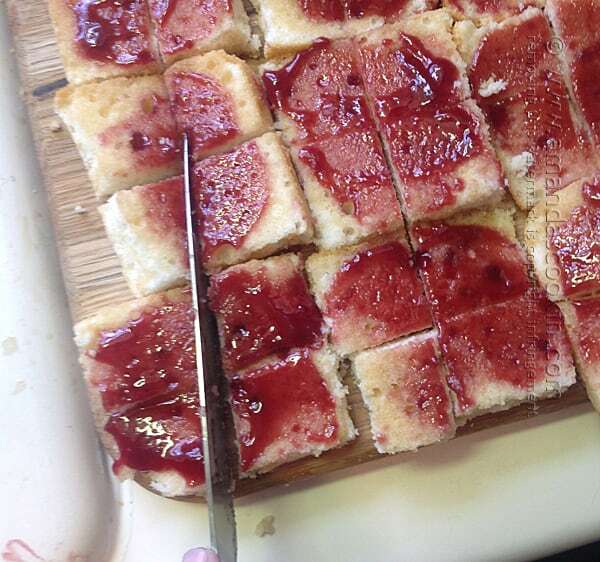 Now spread the jam on top. 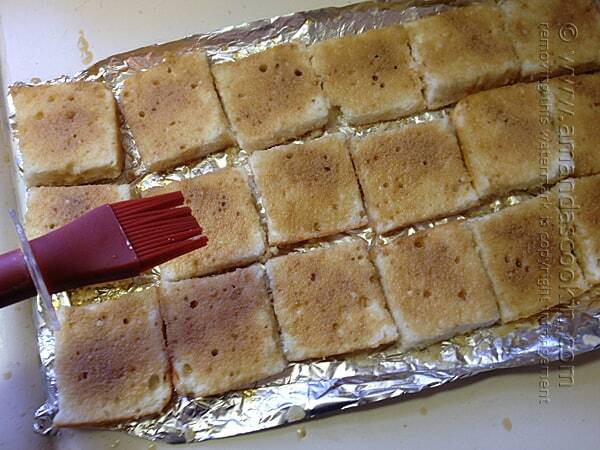 Cut them into small squares. I chopped fresh strawberries and used fresh raspberries as well. It’s not uncommon for people to use frozen fruit, thaw it out and macerate it, especially in the winter months when [good] fresh fruit is not readily available. Some English cooks don’t macerate the fruit at all, they just use it as is. Unless I’m getting my berries at their peak season, I tend to macerate them or they are a bit too tart. As a side note, I added a few new knives to my kitchen tools. I’ve been in the market for something new and several blogger friends recommended Ergo to me. They are a German knife and are ergonomically engineered. So far I absolutely LOVE them! I’ll share more about them as time progresses, but so far so great! 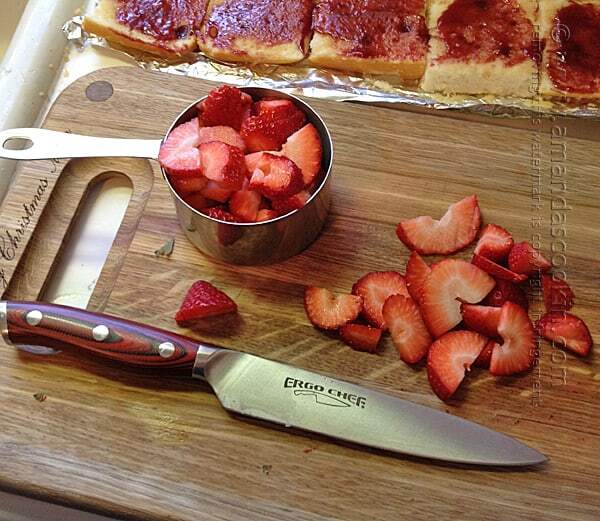 The one pictured here is the Ergo Chef CRIMSON Series 6″ Utility knife with G-10 Handle . 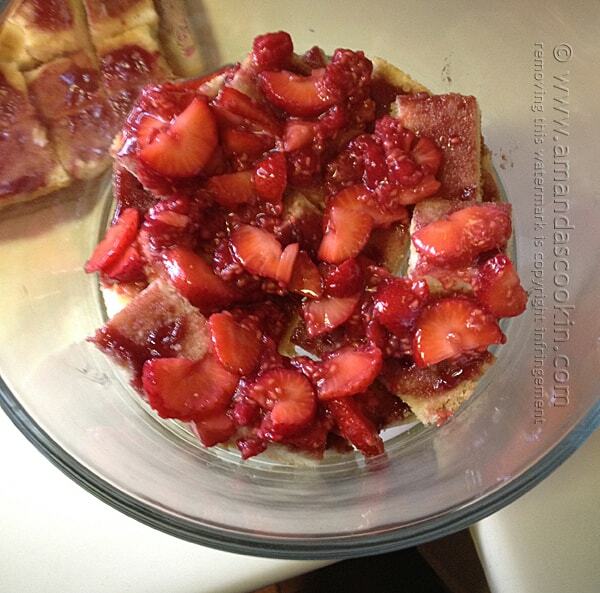 Macerate the sliced berries with sugar and sherry and set aside. When you’re ready to assemble the trifle, layer one-third of the cake cubes, jam side up, in the bottom of the trifle dish. Cover with one-third of the macerated fruit. Add one-third of the custard. Finally, top with one-third of the whipped cream. Now repeat those layers two more times. Garnish with fresh sliced strawberries or raspberries and chill in the refrigerator until ready to serve. Don’t be intimidated by the long list of ingredients and instructions. Most of it is because of the homemade custard. If you order Bird’s Custard Powder you can save all that extra time. Enjoy! You might also like my English Trifle Cheesecake and this Tiramisu Cheesecake as well! Browse all the dessert recipes here. If I had to choose one dessert as the most nostalgic for me, that would be a traditional English Trifle. I love the flavor combinations! HINT: I use my KitchenAid for this, but only as a stand. 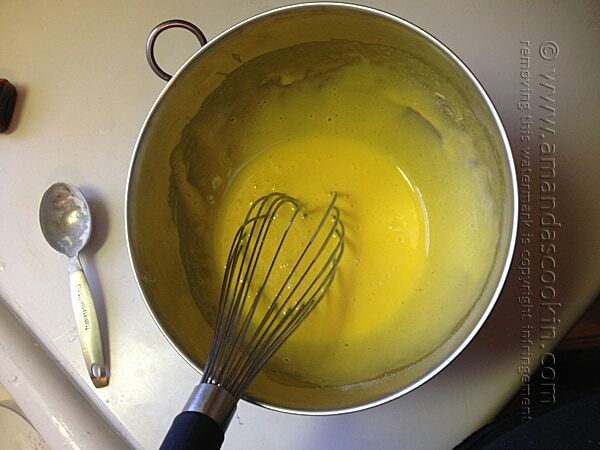 I hand whisk but use the bowl of the mixer attached to the machine so that I don't have to hold the bowl as well. This allows me to whisk and pour at the same time, which is needed in the next step. 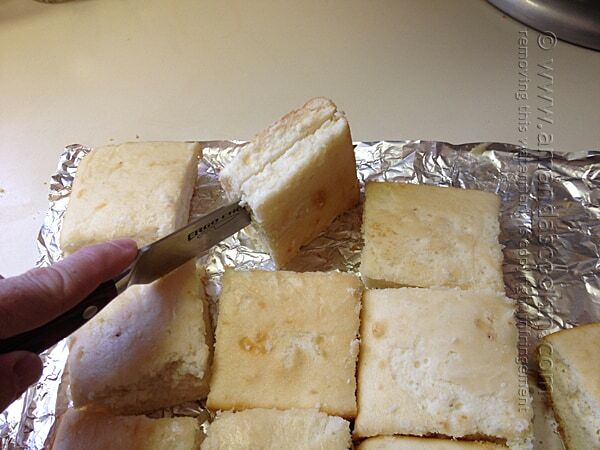 Cut the cake into large manageable squares. Cut those squares in half horizontally. Open the squares so that the cut sides are facing up. Brush the cake with the cream sherry. Spread the sherries cake with the raspberry jam. Cut the cake into cubes. 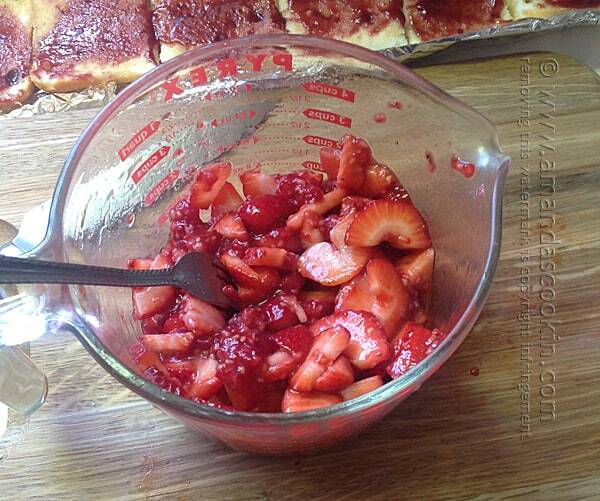 In a medium bowl, combine the strawberries, raspberries, sherry and sugar. Stir to coat and allow to macerate. Keep in the refrigerator until ready to assemble the trifle. Thank you so much for sharing your family recipe. I was looking for a recipe that used the same ingredients my family used in their trifle and you popped up first. Your recipe is as close to our family’s that I will definitely refer to it every time I make it. Thanks again for sharing! I’m always so happy to hear from other Brits that this is the same as their family recipe! 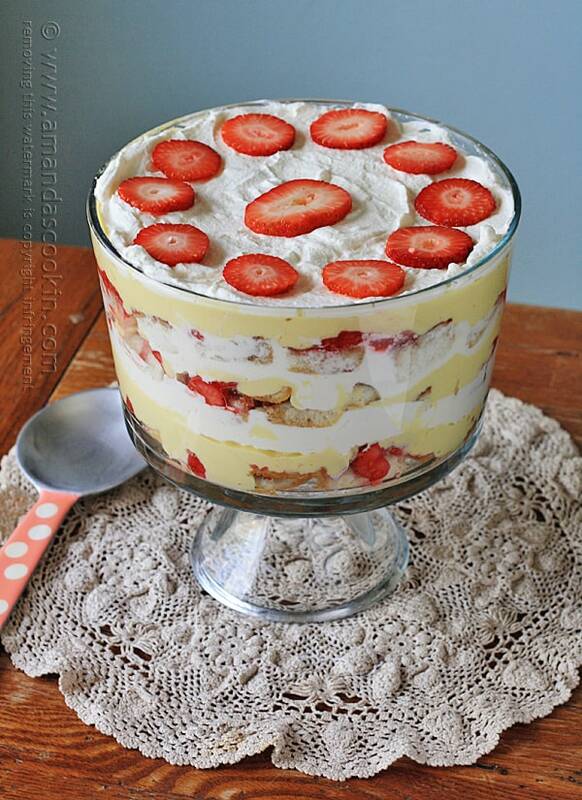 I’ve received lots of comments (mostly on Facebook) that this is NOT a traditional English trifle. They say that it should have jello (jelly) in it. I’ve never had that version. I’ve discovered that there are two traditional English trifles as a result! 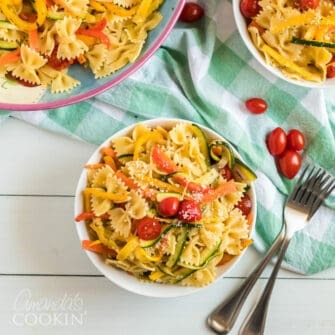 Thank you for this easy to follow recipe! I made the pudding from scratch and I’m feeling pretty proud…smooth as silk, no lumps! My mom used to make this but she was the only one who really ate it. Now that I’m older I love it too and I am making it in her memory. We are also Scotts/British decent. Happy Christmas! What is the capacity of the trifle dish you are using? Hi Anna. My trifle bowl is almost exactly the same as this one >> https://amzn.to/2Af40ph It’s 8″ wide across the top and 9″ tall. When filled with water it holds about 13 cups. I am also a Brit In The US only I didn’t move here until I was 32. I am now 57. I also used canned fruit cocktail, Bananas soaked in lemon juice to prevent them turning brown, canned and fresh Mandarins, jelly or jello since we are in the US. 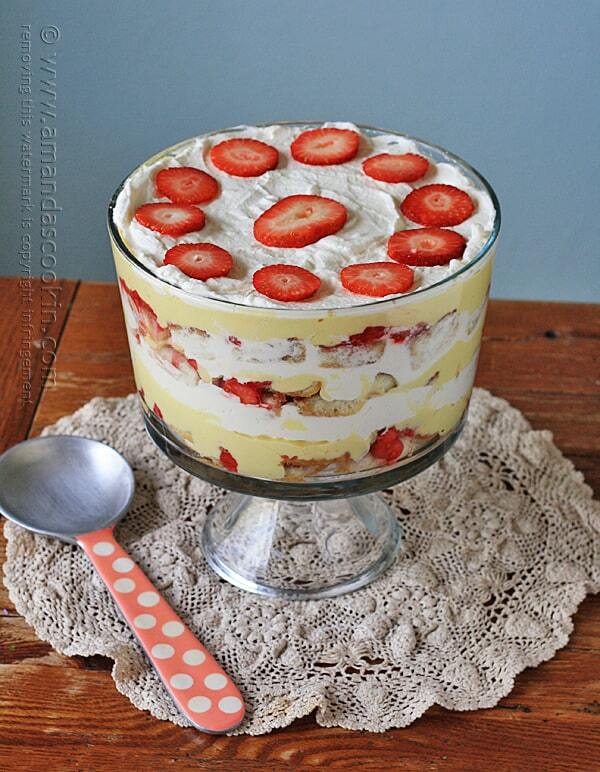 I have never used custard in a trifle but am sure it would be good regardless. I have always use Blancmange and have never heard of custard being used. I have only heard of custard being used for hot desserts like apple pie or cobbler. Blancmange (pronounced Bla’monge as best I can explain it) is used for cold desserts since it sets a lot thicker than custard or pudding. Birds and Pearce Duff brands can be found on Amazon. Trifle sponges can also be found there although, I think they are expensive I have also printed your recipe to try. It really does bring back fond memories of Christmas’s Past. Interesting how different it is! 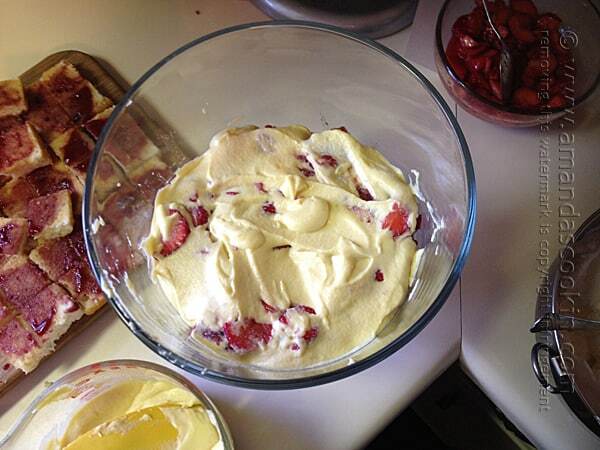 Scot/Brit in BC Canada, super trifle and the story, my Granny, my Mum RIP… made the same great grub, thanks for your postings. God bless the Queen. Would it be ok to use vanilla pudding instead of the custard?